Playing video games is probably my favourite past-time. Its usually the only time of year that I have the time to pretty much sit around and do nothing, thus indulging in a little gaming can be done without much guilt. I remember from my days in University where I would even plan out the game I wanted to play during the holidays in advance. Some of my favourite holiday games from the past are Wing Commander IV (1995), C&C: Red Alert (1996), Total Annihilation (1997), Starcraft (1998), Homeworld (1999), Diablo II (2000), Civilzation III (2001), Warcraft III (2002) and Civilzation IV (2005). 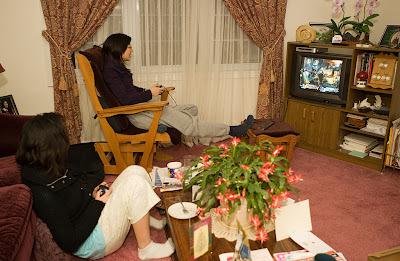 In 2003 I played no games (nor did much of anything else) as I worked feverishly through the holidays to complete a paper submission, and in 2004 I spent the holidays in India. All of the games I have played in the past have been PC games, however in the last couple of years I've all but stopped playing PC games. I was fortunate enough to get a Nintendo Wii this summer so this holiday season I'll be playing Wii games, though I still haven't discovered what the killer Wii game that will occupy my time will be. Technical Specs: Canon 1D3, 24-70 @ 24, f/2.8, 1/40s, ISO 1600. Safari pictures are finally up!